It is Christmas week and I’ll be glad when it’s over. I admit I like homemade fudge and I like eggnog but I detest this holiday. My house looks so spare at this time of year. I don’t put up a tree or hang a holly wreath. There are no reindeer in the yard. Outside the front door is a green nandina, covered in red berries. But I didn’t do it. 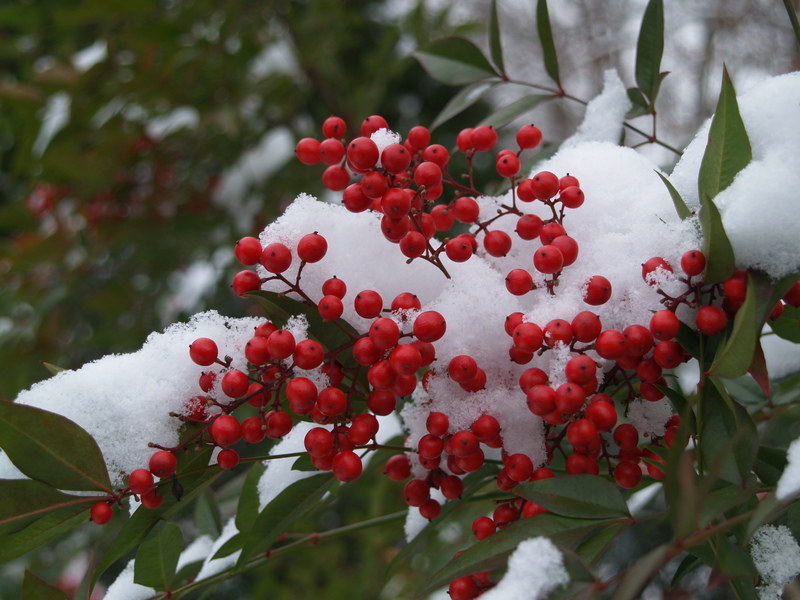 I love nandina berries in the snow! I stopped observing Christmas in 1983 but I think my disillusion with the winter festival started before that. I stressed about gifts when I was a teenager. I didn’t have much money, but I put my heart and soul into finding the perfect gifts, then cried when I got nothing in return. I hated the year when my brothers didn’t come to the family gathering because they were at odds with one another. I remember one year buying a beautiful, perfect evergreen, setting it up in my apartment and never putting a single decoration on it. I intended to, wanted to, but as the day grew nearer I realized I dreaded the chore. I simply enjoyed the smell of the bare tree that year and felt guilty for wasting $45 on it. When the season was over and artificial trees went on sale, I bought one. The next year, I married a man who abhorred Christmas and I never got to take my fake tree out of the box. The media hype says Christmastime is “supposed” to be a time of love and peace and cheer. Instead it has become of time of financial stress, time constraints, headaches, cranky kids, crowd control and traffic accidents. I think people feel guilty when they admit they hate Christmas. Christians especially suffer because they’re trying to make it all about Christ. How can they admit not enjoying that? Let me relieve your mind, at least a little. Jesus is not the reason for the season and He never was! Most serious students of the Bible will concur that Jesus could not have been born in winter. Students of religious history will discover the mid-winter celebration of a god’s birthday (Nimrod or Mithras) dating back at least to the Babylonian empire, more than 600 years before Jesus was born. This is about the time the prophet Jeremiah warned the nation of Israel about the decorating of an evergreen tree (Jeremiah 10, Christian or Jewish Bible). Just about every Christmas tradition has its roots in an ancient pagan religion: holly, mistletoe, caroling, gift giving, trees in the house, over-imbibing, Yule logs, Santa’s sleigh and more. The rest of them (Rudolph, Frosty, et al) were invented to make money. No wonder the world feels comfortable embracing a supposedly Christian festival! I am a Christian who does not celebrate Christmas. That’s the red and green of it. Oh, but I do enjoy nandina berries in the snow. This entry was posted in Short Takes on Life and tagged bah humbug, Christmas traditions, history of christmas, Jeremiah 10, Jesus is the reason, Mithras, Saturnalia, Winter solstice. Bookmark the permalink. Well, my thoughts are giving with the thought of receiving is not my idea of giving. Conflict is not recognized by God, nor is guilt, fear, etc, so non-existent. Many things you find objectionable are not only geared toward money, but joy for God’s small children. I prefer to continue my belief in Santa as I am a kid at heart. I doubt that you will change anyone’s mind about how they celebrate the coming of Christ or when, but for me everyday is a celebration. I have no tree, wreaths, decorations, or baked goods this year, but I will give gifts out of love. And isn’t it all about love? Love for our brother who is also the Kingdom of God, one in Him as you and me? I see the light of God in you and I hope you see it in me. My intent was not to “change anyone’s mind” but perhaps to help them see and relate to other minds. I wish Christmas was “all about love.” I truly do. I do see the light of God in all my brothers and sisters! (In part, perhaps, because I’m always trying to see it.) Really appreciate your response.